One of the easiest desserts you can make involves fruit and a grill. 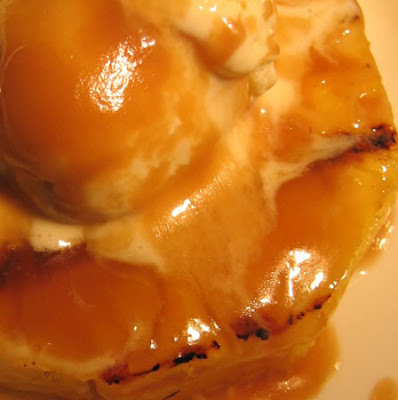 Simple slices of pineapple, grilled to invoke a sweet smoky flavor, then topped with ice cream and caramel. There are two ways you can make this - if you're really short on time you can simply stop pick up at the grocery store and pick up some ice cream, a can of pineapple and a jar of caramel. If you have a little more time, you'll find it so satisfying to actually make the ice cream and the caramel... either way, it's a quick simple end to any grilled meal. If you're a making you're own ice cream, be sure to do this the day before. See one of my recipes for ice cream, I think the black pepper and the mascarpone ice cream are both good with this. Have tried the lavender honey ice cream and it was just a bit too many flavors. If you're using canned pineapple, just be sure to get the round slices, not the diced. I would urge you to get a fresh pineapple though, the flavor is just so much more pure. Clean the pineapple, be sure to get all of the outside husk off. Now slice the pineapple in 1/2 inch thick rounds. You will need to cut the middle core out - either use a round cookie cutter, if you happen to have one the right size, or simply use a pairing knife. Try to keep the pineapple in one piece so you have something that resembles a donut. Have your slices ready, then start the caramel sauce. If you're using a bottle of caramel, just simple warm the sauce. But the recipe I'm giving you is so simple it's done in minutes! Take equal parts of butter and brown sugar, bring to a boil, whisking constantly. Once that mixture has come together, whisk in roughly an equal part of whipping cream. Let that simmer for about 5 minutes, whisking occasionally and your done! it's that easy. With the whipping cream, I never measure. I just add until the deep caramel turns a lighter golden color and thins out a little. You'll can adjust based on your tastes and the humidity that day.As far as the portions, start with 1/2 of each ingredient, it's going to give you around a cup of caramel sauce. You can always move into one cup of each if you have a larger crowd. Plan to serve this immediately. Start with a clean grill. Simply drop the pineapple slices on the grill for about 4 minutes, turn over for another 4 minutes. Place one slice on each plate. 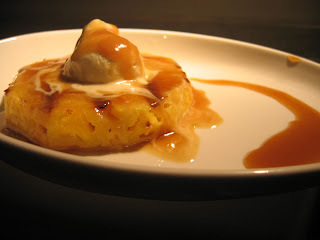 Add a scoop of vanilla ice cream in the middle of the pineapple and drizzle with your homemade caramel. Voila, you've got a fat and happy dessert that will wow your guests!